Eric was another product of the Tiger Stevenson Training Schools at Birmingham in 1946/7 he joined Cradley right from the start, although rather inconsistent, scoring two points on four occasions he also scored two elevens and a twelve point maximum in 1947! 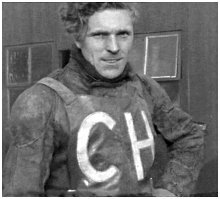 He settled in as third heatleader in the Cradley side in 1948 scoring an incredible sixteen maximums for an overall average of 7.89. At twenty-nine years old he was one of the oldest members of this 'Cubs' side. At the beginning of the 1949 season he shocked Cradley by quitting the sport due to the illness of his wife and sat out the whole of the 1949 campaign, though he did act as an instructor at a training track at Earls Barton near to his Northamptonshire home. Eric joined Oxford in 1950 to help them to take the Third Division title and gain promotion. 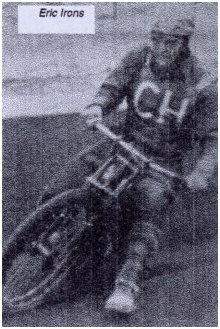 He stayed with the Cheetahs for the 1951 season before joining Wolverhampton in 1952 where again he stayed for another season in 1953 before hanging up his leathers for good at the age of thirty six early in 1954. Eric passed away in 2012 aged 94. He was one of the last remaining riders of the original Cradley team.